It’s a little girl’s worst nightmare to have a shirt or dress get too short. 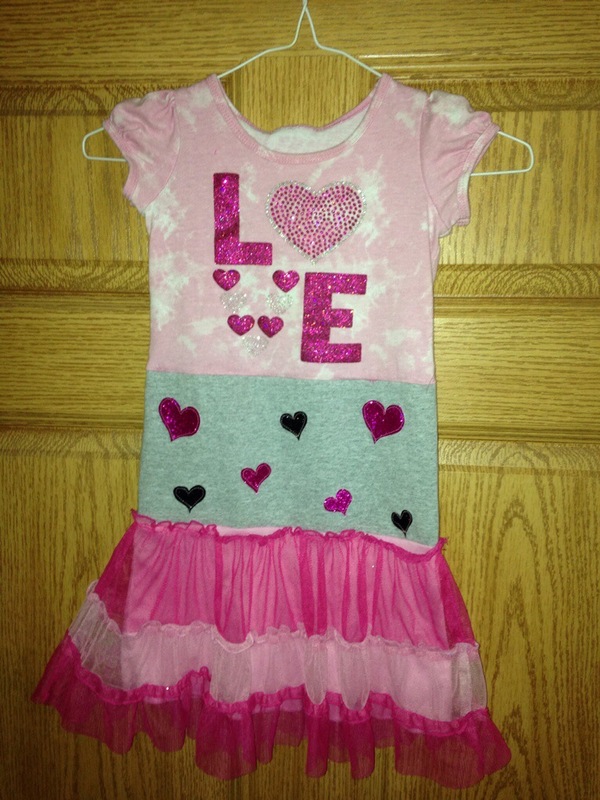 My 3 year old had a 24 month dress that she didn’t want to give away and asked for me to fix it. I was wondering when the “mom can fix it” was going to start, I only hope they stick to things that are easy to fix. So, let’s get started, below is what I started with. The first thing I did was take the stitches out on the bottom part that gave me three pieces. I put the dress/shirt on my little one to determine how much longer I needed it. I decided to add about 5 inches. 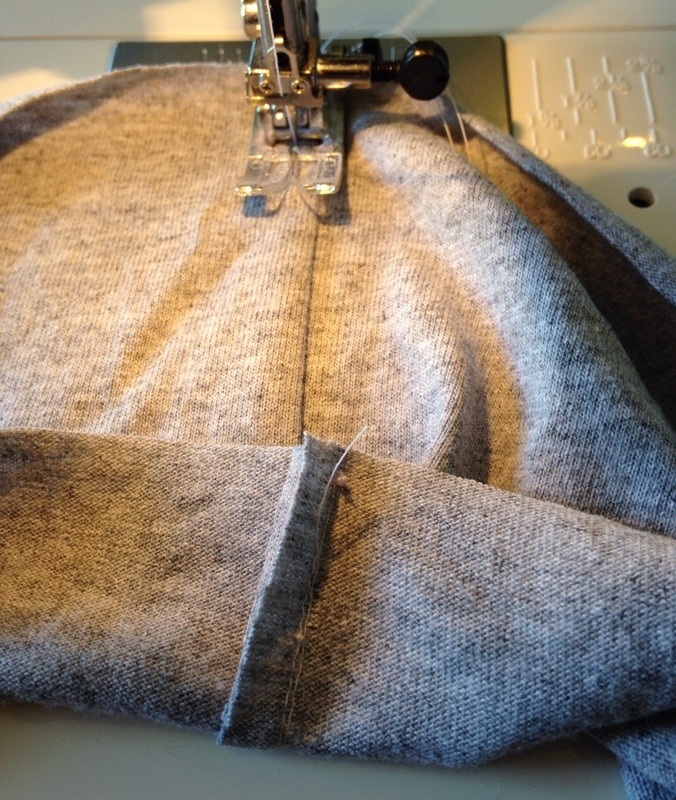 Then I took an old grey t-shirt and cut 6 inches off the bottom, not including the bottom seam. 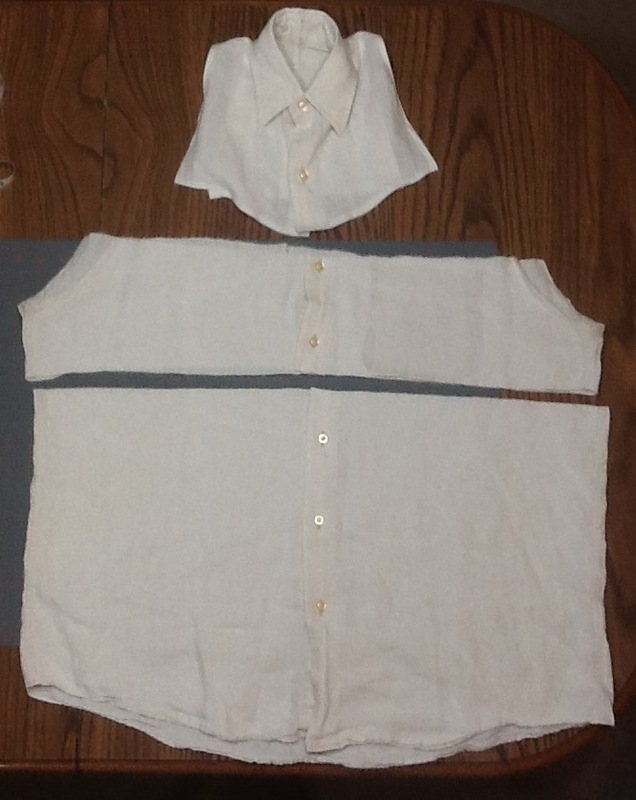 Then I lay the top of the shirt on the t-shirt bottom (inside out) to figure out where to sew. 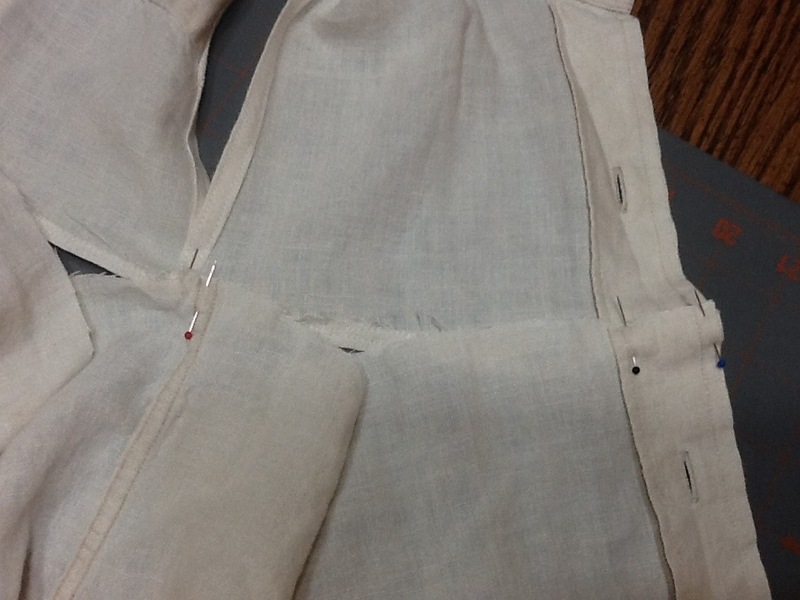 After sewing along the chalk line I cut along it, then squared off the bottom seam. Finally I reinforced the first sewing line. Now I have four pieces. Finally, it’s time to sew the pieces together. 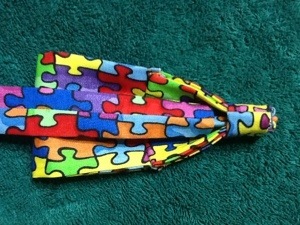 First, turn the top and middle pieces inside out and sew them together. Do the same to the bottom piece. 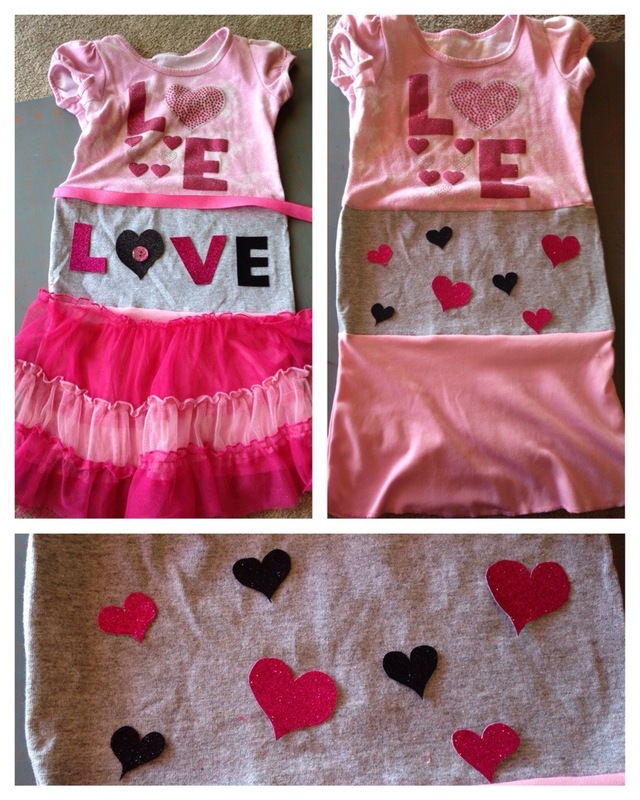 I set the dress aside and cut out the word “Love” as that was already on the dress (for the back), then cut out a few stars for the front. I decided not to use the pink ribbon or button, as it looked so awesome without it. 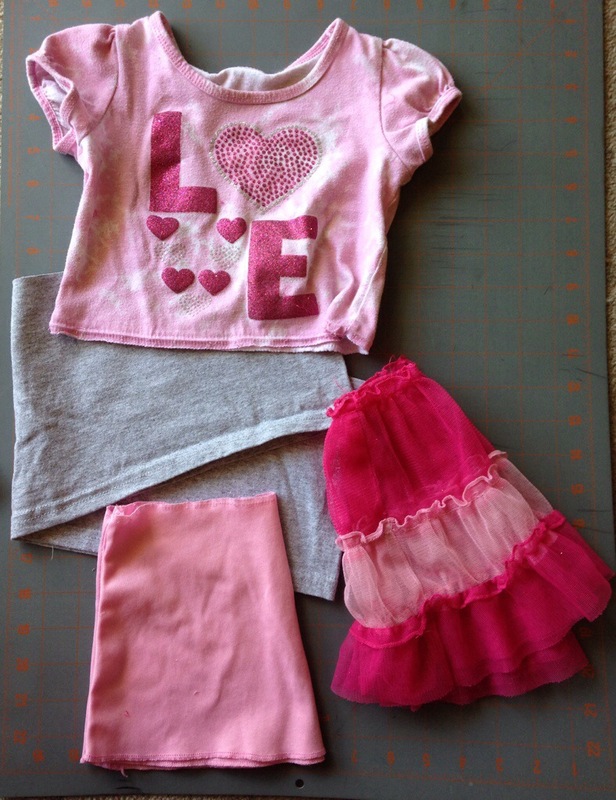 Then, when I was ready to sew I used a trick I learned on Pinterest, tape the pieces and move the tape as you sew them on. 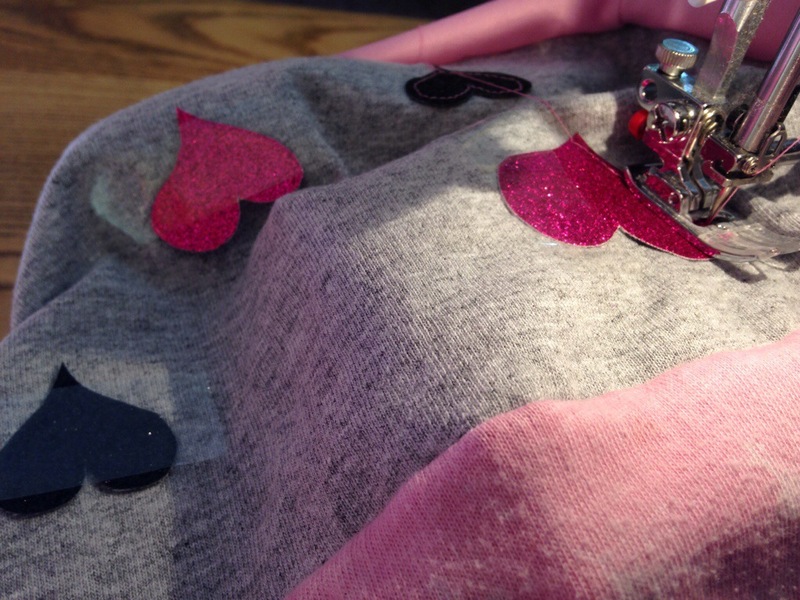 That way I could place the hearts exactly where I want them before I sew them on. 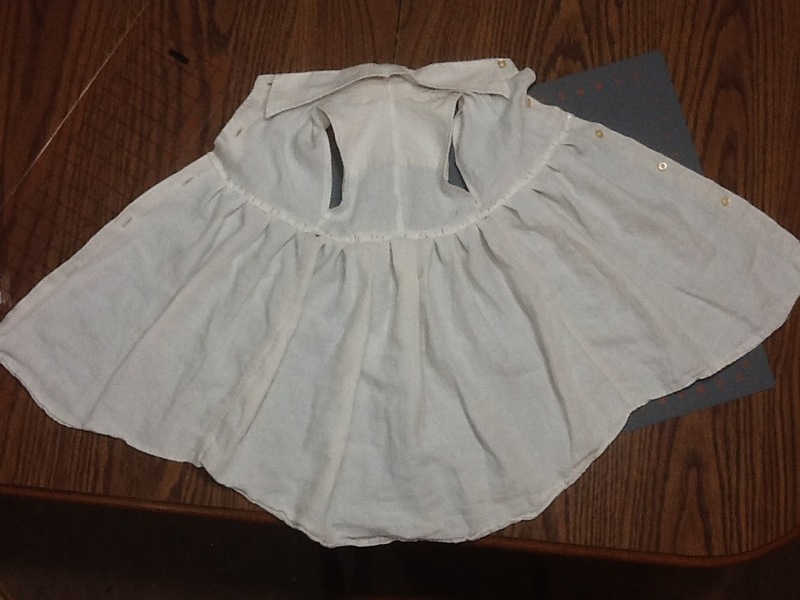 Then I sewed the bottom ruffles on, it’s much harder than I thought. Looks like I need a little practice with tulle. Here is the before and after! I’m so excited about how cute it turned out! My oldest decided that he wanted to be a pumpkin for Halloween, so a pumpkin we made! 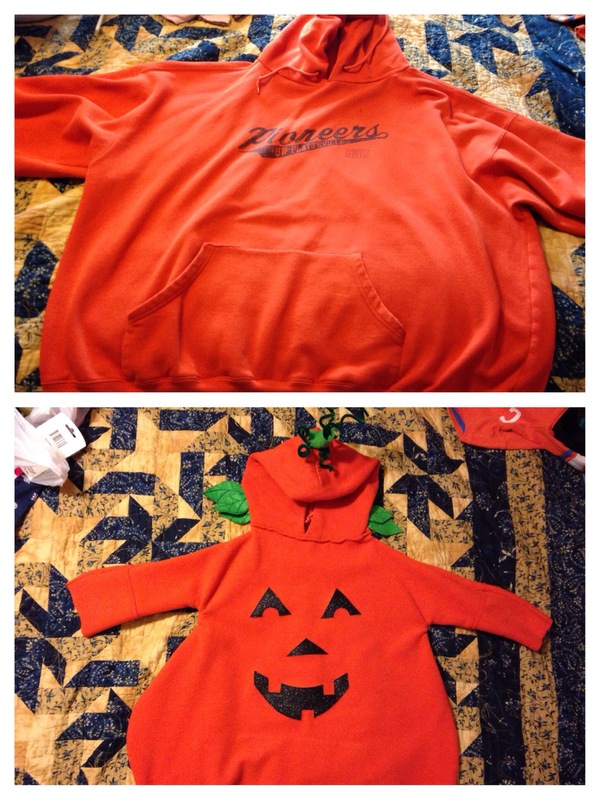 I started out with an old orange baggy sweatshirt, some green felt, black sparkly stiff fabric, and pipe cleaners. I also printed out a leave (3 different sizes), and a pumpkin face, cut them out and used them as my template. 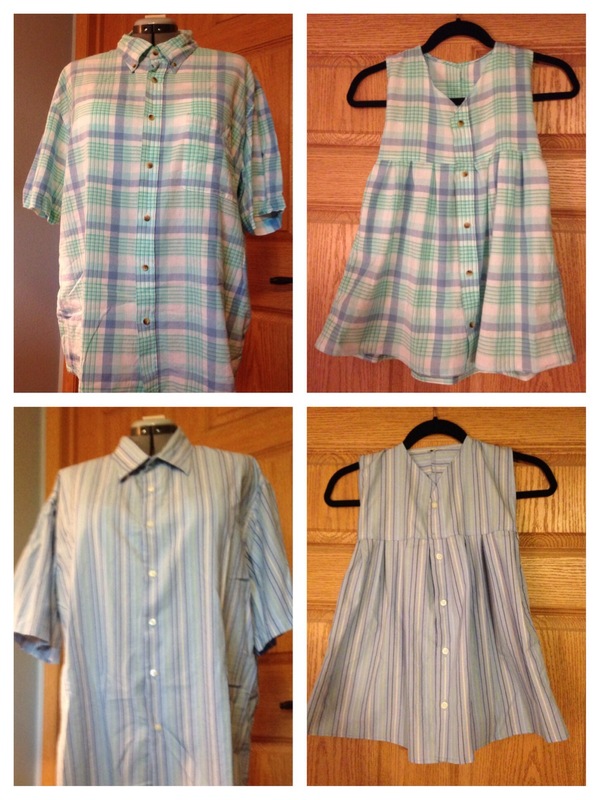 A month ago I went to my parents and they were going to give away more dress shirts so I grabbed a few to make more little girl dresses from. This time I decided to try a different style that doesn’t have a collar, for a detailed refresher check out the post. 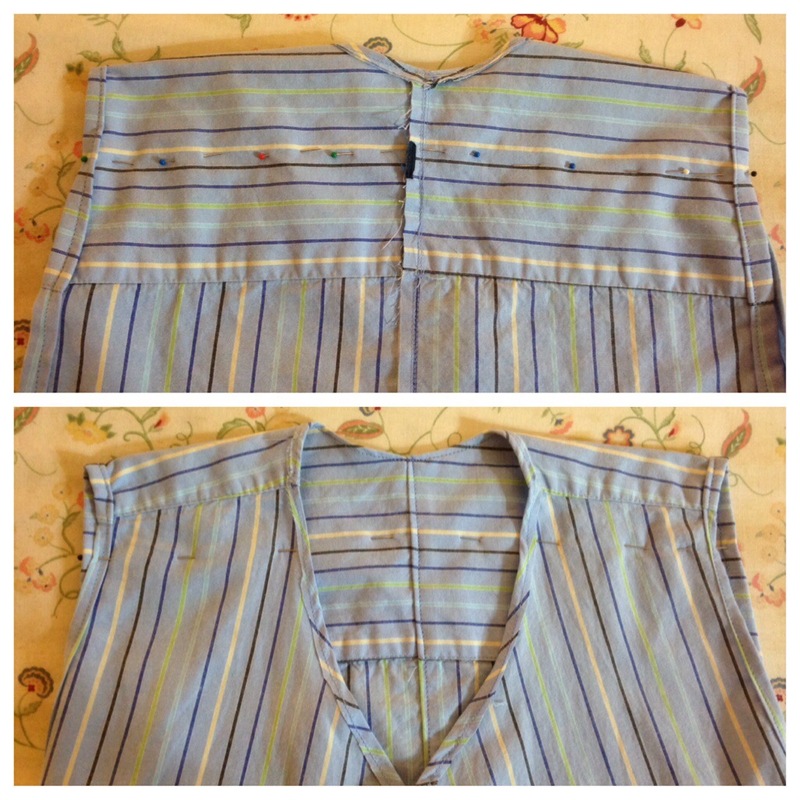 I started with this shirt, and took the collar and arms off with a stitch remover. I followed my previous instructions for the most part. 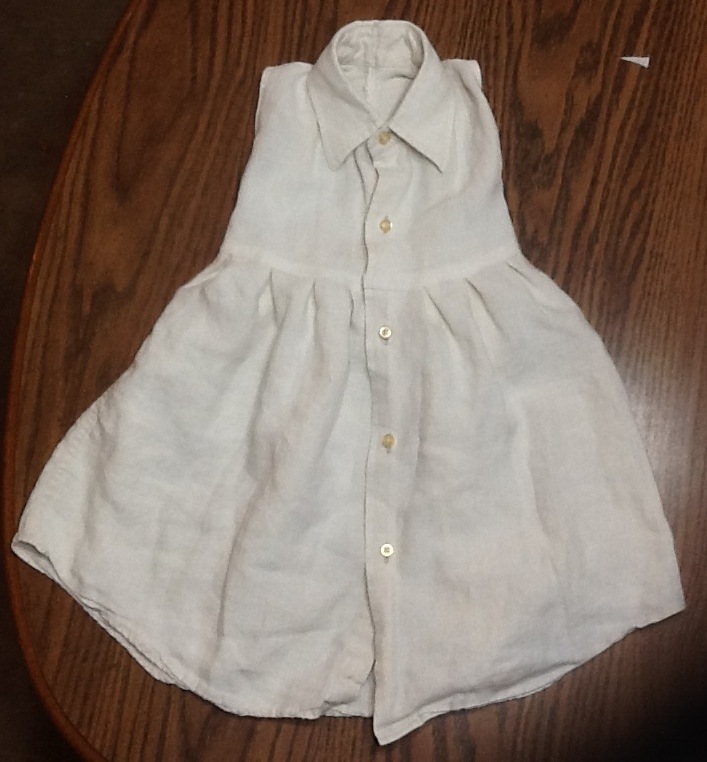 Before I pinned the bottom part on I fixed the collar and I also folded and ironed the bottom part of the top. 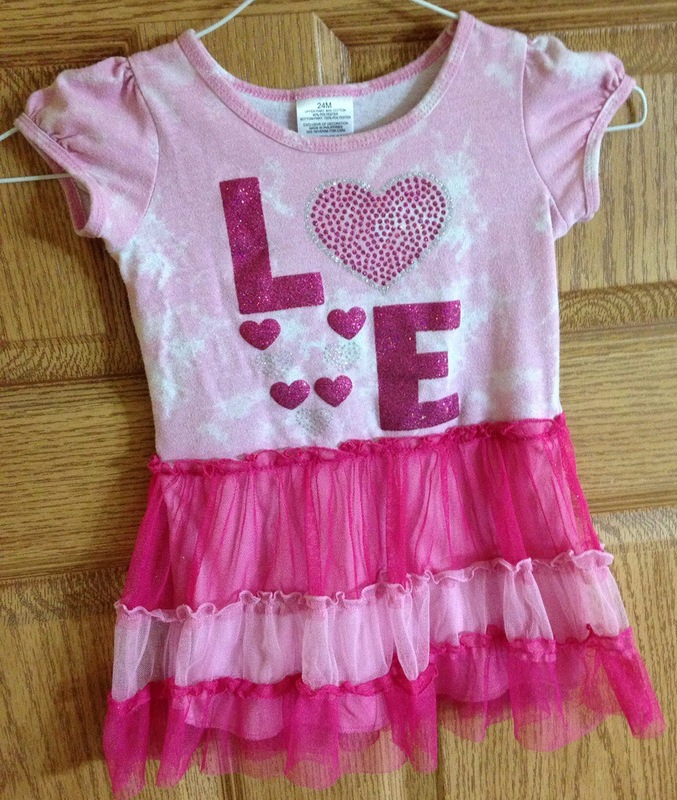 The shirt I used was a bit larger than the first one so when I tried it on my little girl I realized I had to make a slight adjustment. I sewed in 2-3 inches at the bottom of the arm hole. While I like how this turned out, I thought the collar was a bit low. Luckily I was in the middle of making a second one! This time I decided to take 2 1/2 – 3 inches off the top. 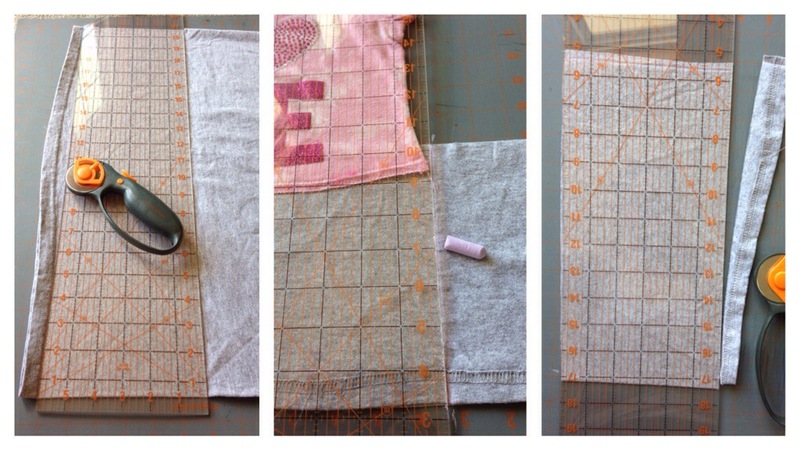 I measured and pinned. Then I turned it over and pinned along those lines just where the front part was, and sewed ONLY where there was fabric on both sides. After sewing I cut straight across. Then I ironed it flat and sewed a straight line. That’s it! Both dresses turned out great! 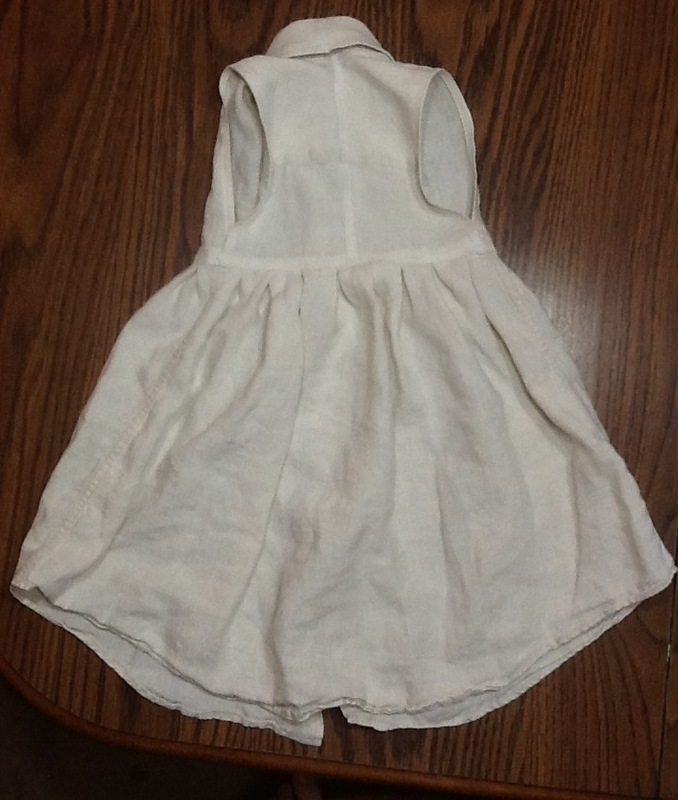 With folding and ironing the bottom of the top the dresses didn’t need the ribbon. 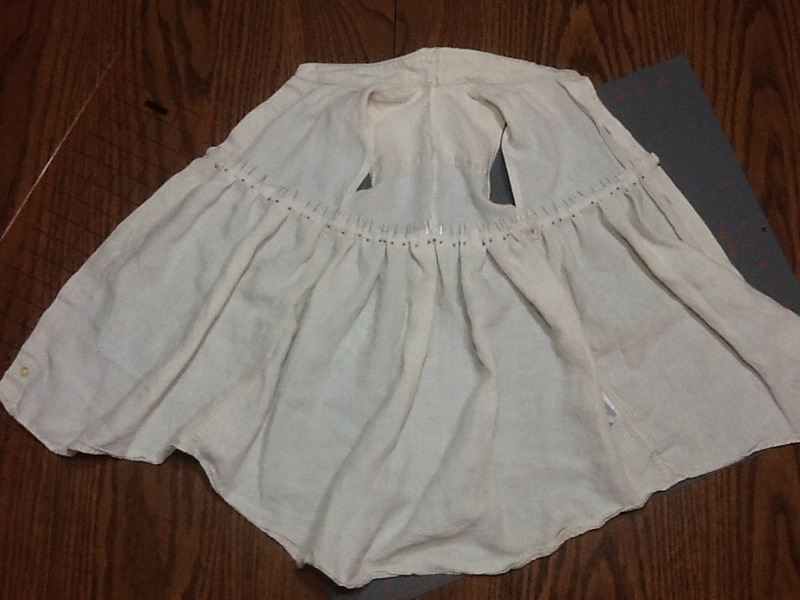 The only thing I could have done better was take in a little more around the arm hole because the dresses were a little big around the waist. I spent a lot of time searching for the right inspiration for this project, in the end I didn’t follow any patterns. 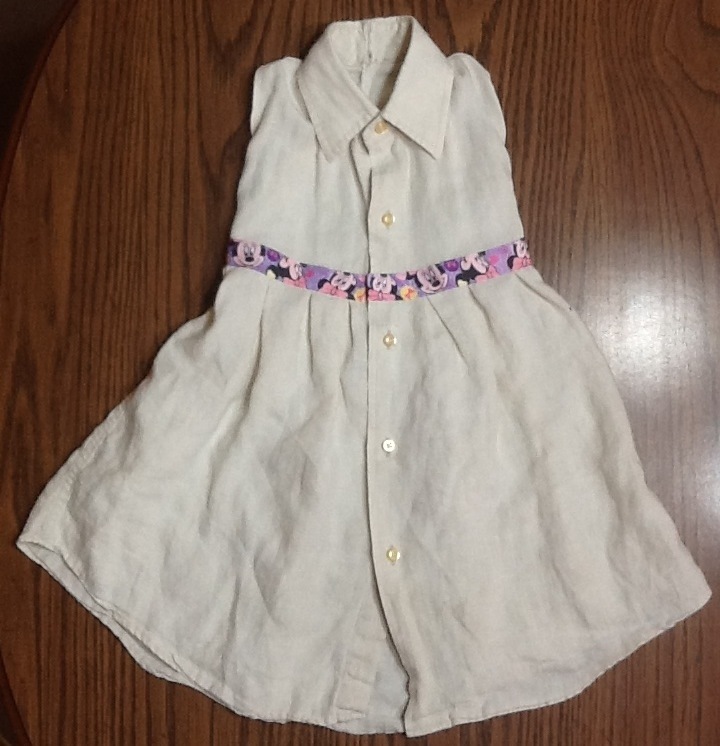 My dad was getting rid of a few old dress shirts of his that I thought would work so well for a dress for my youngest because I just loved the feel of the fabric for a nice summer dress. I started by using a stitch remover to get rid of the arm’s, I wasn’t sure if I wanted to cut it because I wasn’t 100% sure what I was doing yet. 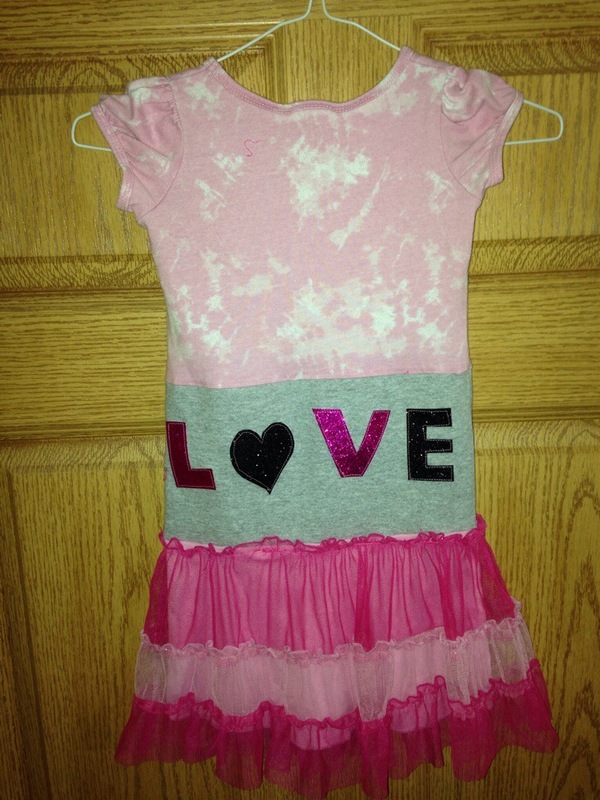 Then I put it on my little girl to try and decide how I needed to modify it. 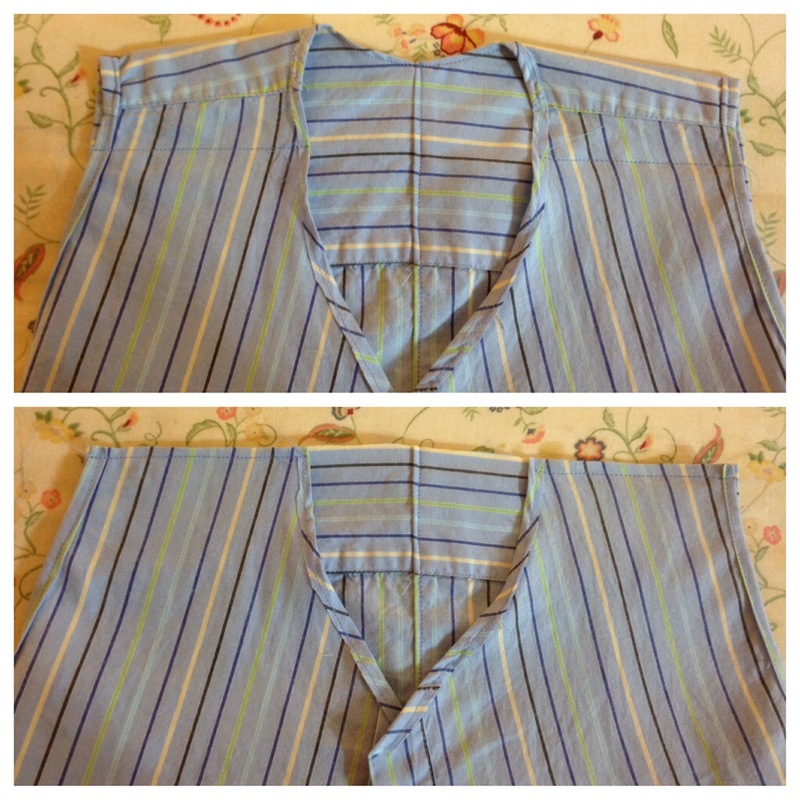 I decided to make a cut at the top of the third button (so the top part had the first two buttons). The bottom of the shirt was set aside for later. 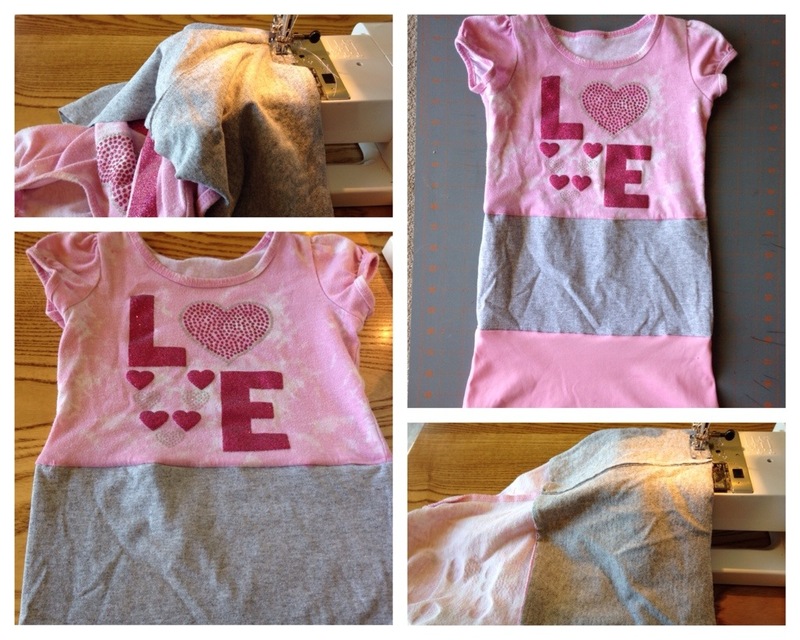 Once again I put the top part of the shirt on my little girl to try and decide how much of the color to remove. I decided that I needed to get rid of 5 inches. 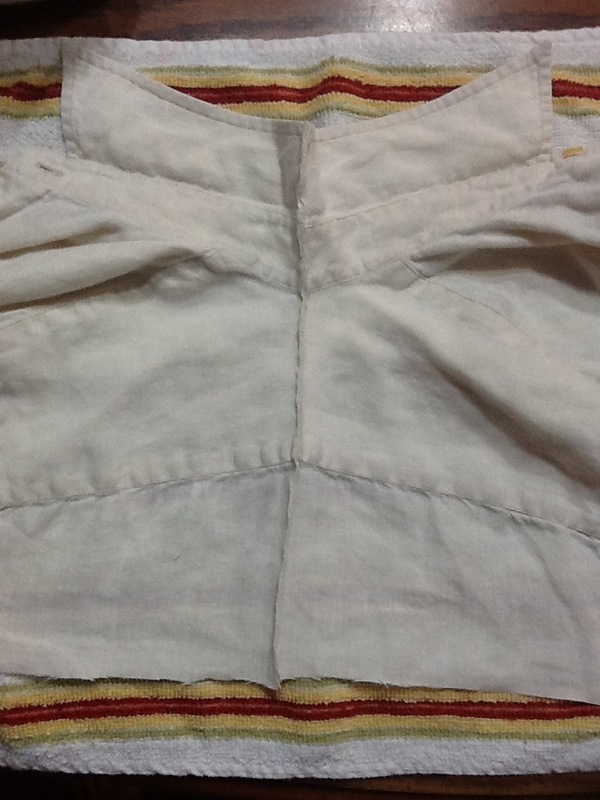 The entire top needed between 4 & 5 inches removed so I folded the collar in half and cut down along side the entire piece (see image below). 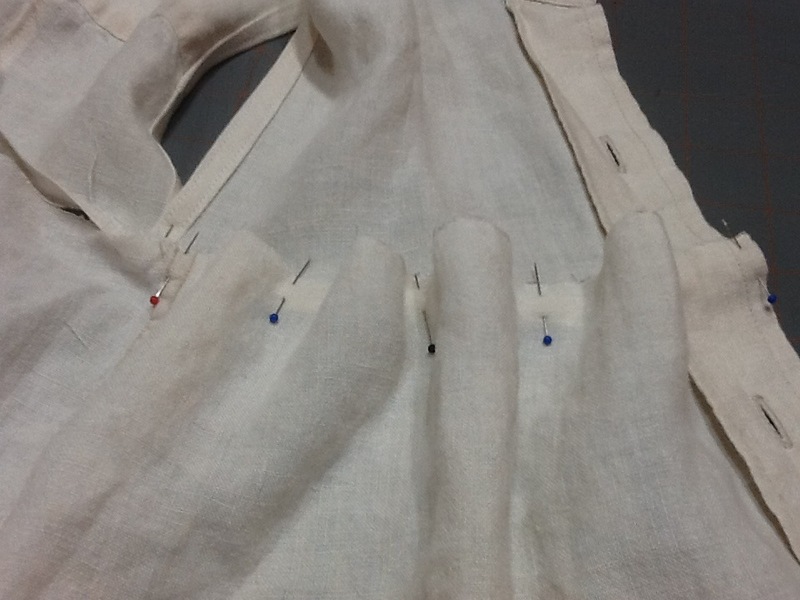 Then, I decided to remove 2 inches from the collar, I measured in several spots and placed pins a little under so I can cut with the pins as a guide. 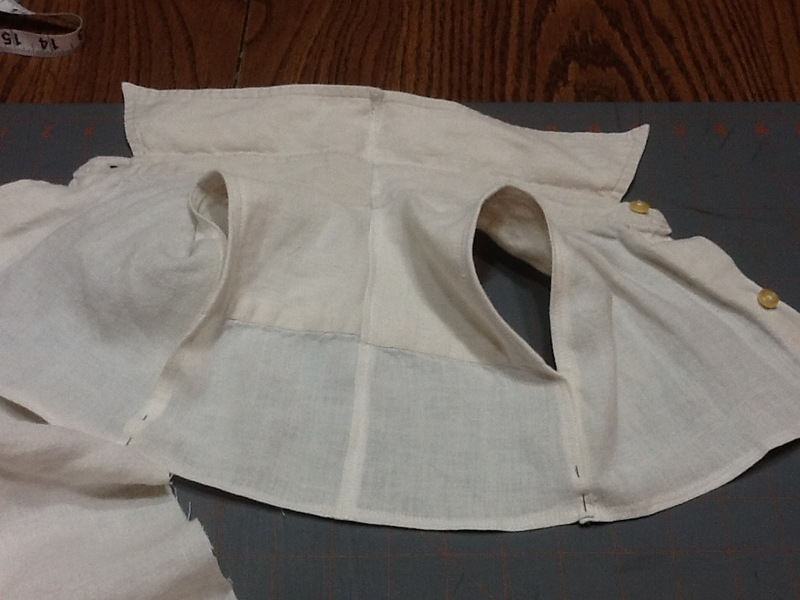 Here is one half pinned and the other cut. Ok, here’s the part I messed up, (but was able to fix) so check your work! I pinned the two pieces back together starting at the collar. Make sure you line the pieces up, they may not match 100%. 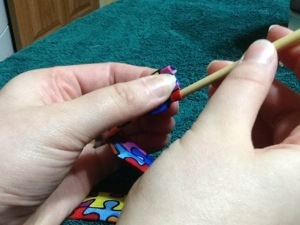 If you want the seem in the back to be center make sure you line them up with the outside pieces first. 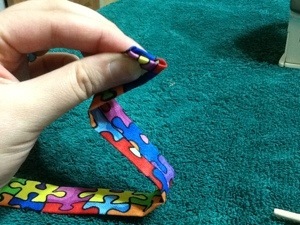 Then pin them up and sew. 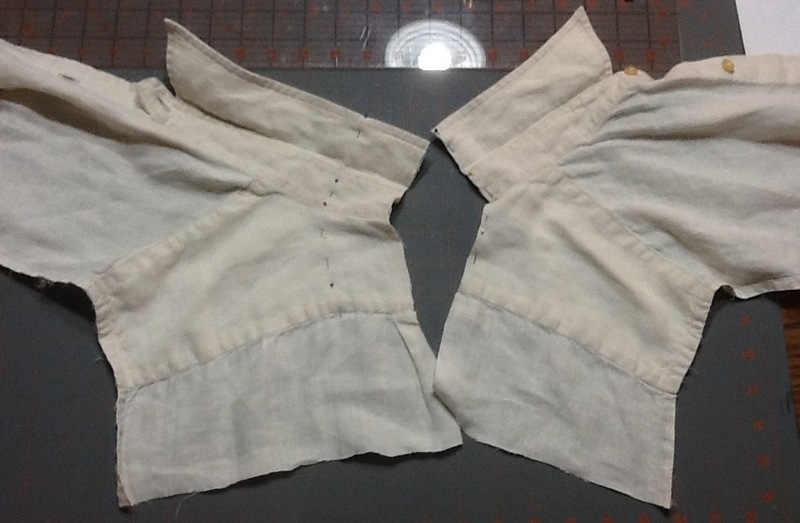 One thing to keep in mind, The collar folds over, so if you sew the two pieces together the same way both ways you will end up seeing a seam somehow. 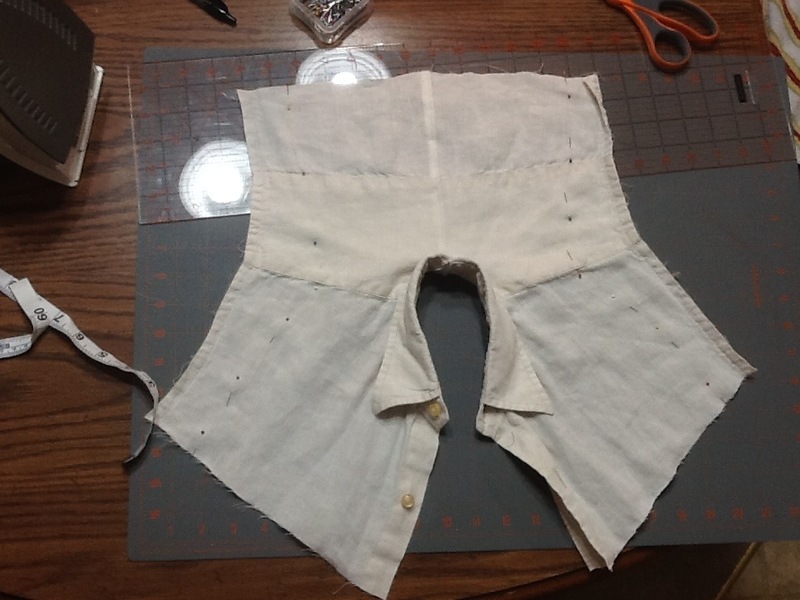 You can sew the first half of the collar one way then sew the rest of the top part the opposite way to hide the seams. 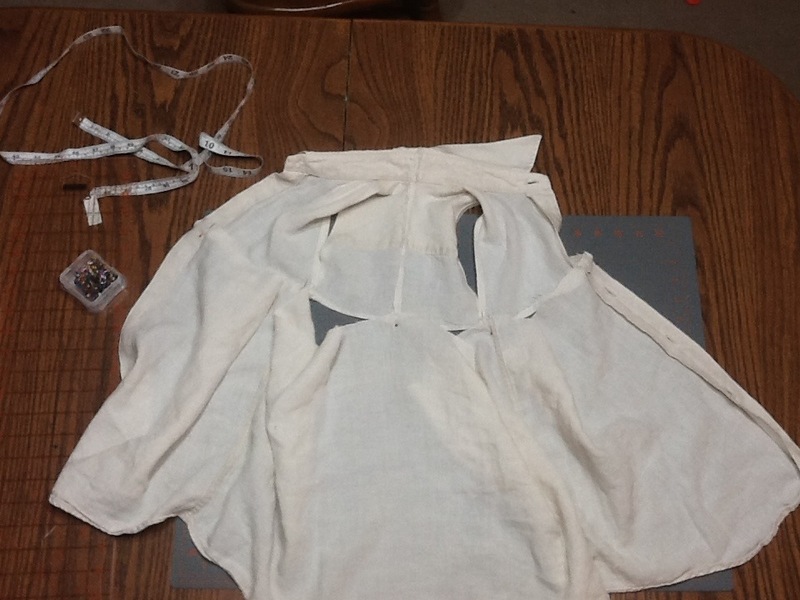 Here is what it looked with the top collar part being sewn correct and the rest of it sewn wrong. I figured out that I had it wrong after I ironed the seam down to one side. To fix it I sewed just the top collar part twice to keep the seam part down. (Not really sure how to explain that part). 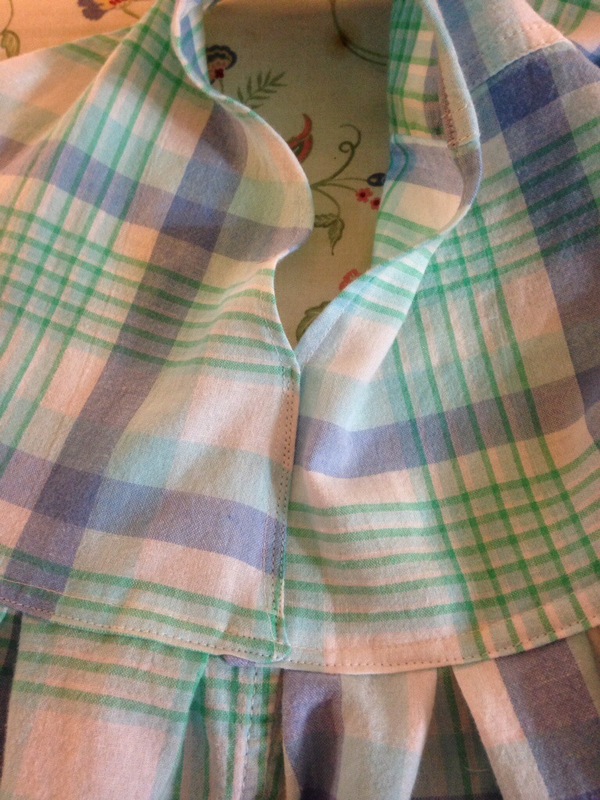 Once I cut both sides, I ironed each side folding over twice so the edge was totally hidden. 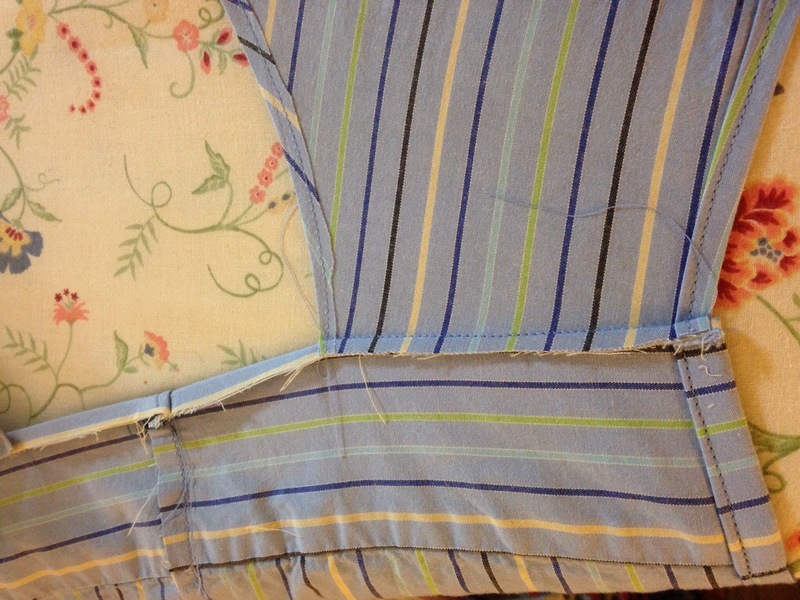 Then in some of the thicker spaces I used pins to help keep the fold in place. 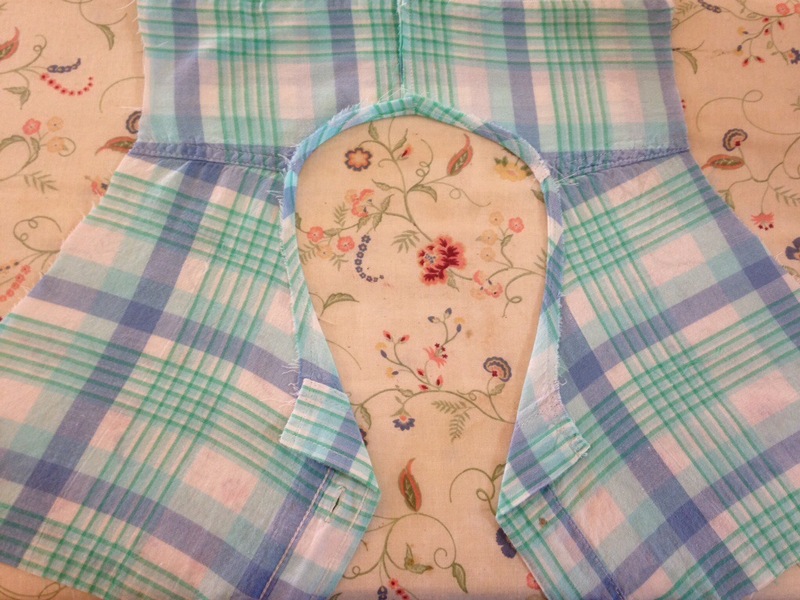 Once I sewed those two spots I ironed the bottom 3 pieces (back, front left side, and front right side), this time only folding over once because it would be inside and not seen. Now, I realized I forgot to take a few pictures of how I did this. So Here’s one to show you where I cut on the shirt for the top half. I guessed on where to cut for the bottom, I decided to cut right under where the pocket was. 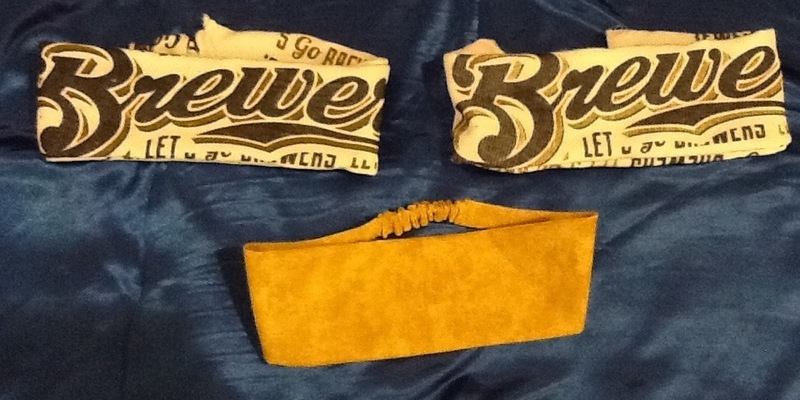 The middle piece in the picture was not used, the entire bottom piece will be used as the bottom skirt part. Now, time to clear off a nice big space and get logs of pins. The first thing I did was pin the arm holes. To start with I pinned up the front left side, back left side, back right side, and front right side. On the front pieces I Pinned the button hole/button seems matching them up. The 4 sections all have the “loose” material. Now, for each section I found about the middle and pinned, then did that twice more for the two spots so for each of the 4 sections I had 3 pins each. Ok, finally, time to start pinning the skirt material flat. 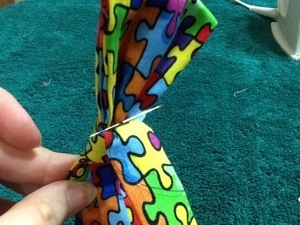 Start by pinching the material so it is flat with the material looped up. 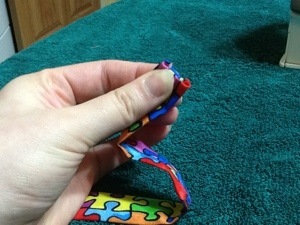 Use a finger to push down on the loop to flatten it. 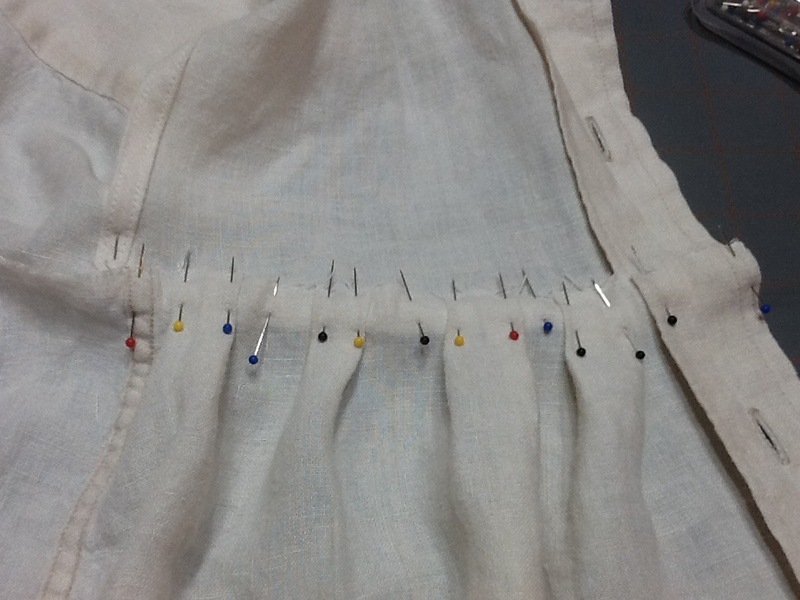 Then place two pins to keep the folds in place, see the pins to the left on image for how it should look like once pinned. Here is what an entire section looks like from the inside and outside. All done! Here is the front and back of the entire dress pinned. I’m not sure if you can tell from the picture below but the back of the dress has more material than the front because in the arm area I did not want to sew 3 seems. 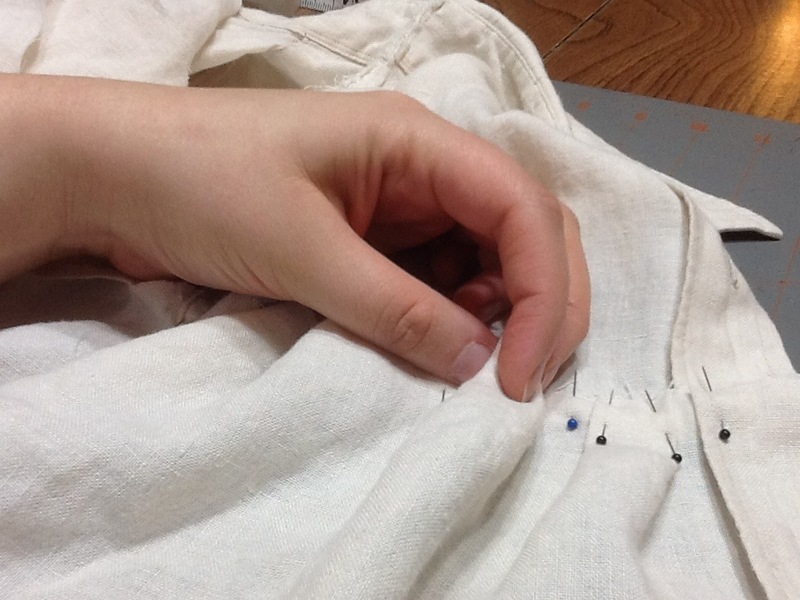 Then sew! What I found to work well was to sew slowly taking a pin or two out and stitch a few while trying to stay in the center. 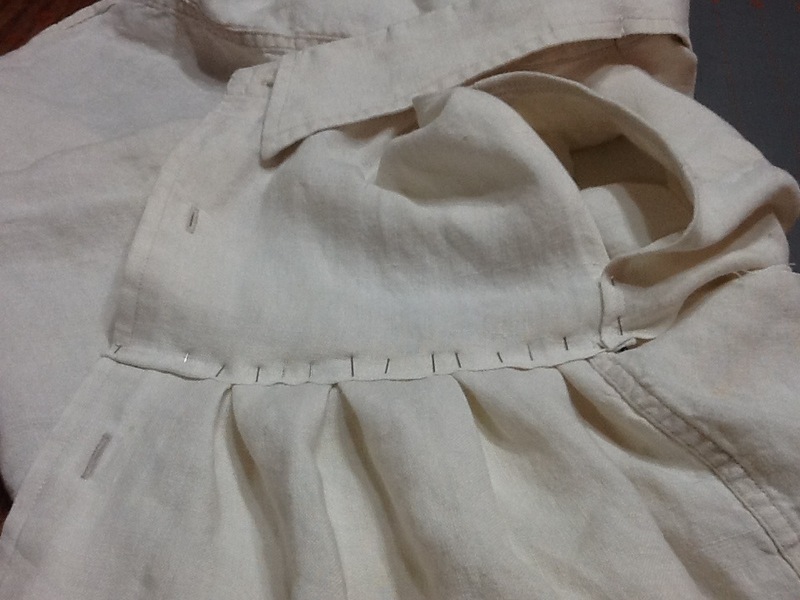 Then once all the pins were out I sewed along the entire dress again 2-3 stitches towards the top of the dress, then after re-enforcing the stitches I turned the dress over and stitched one more time across the entire dress, but this time I stitched the bottom of the top seam. This is what I have so far. 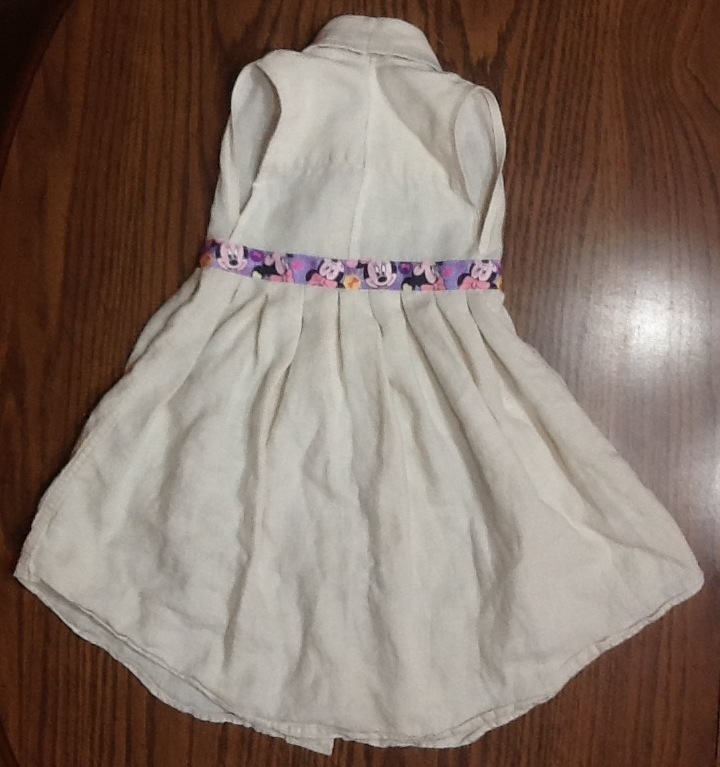 The dress could be considered done…but I think it needs a little something so I’m going to sew some ribbon along the waist. You could sew belt loops and add a belt, or keep it as is. 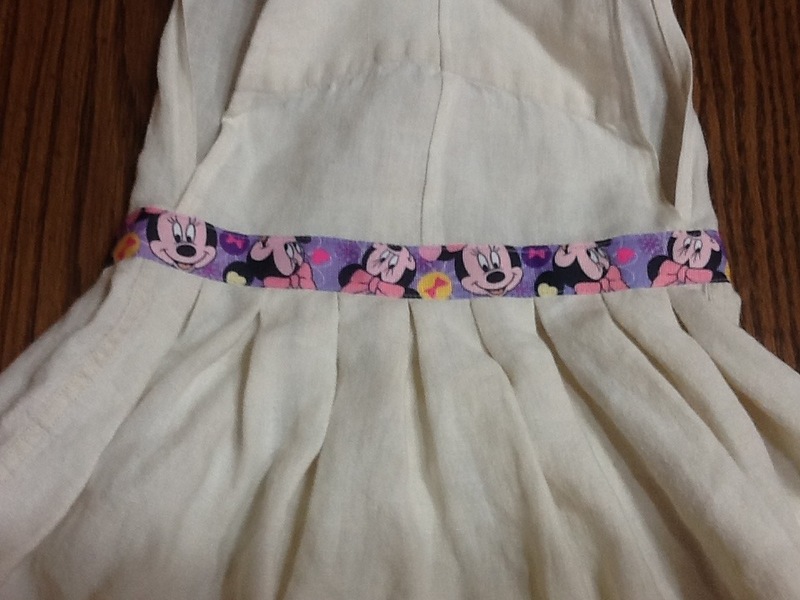 I found some Minnie Mouse ribbon that finishes the dress! 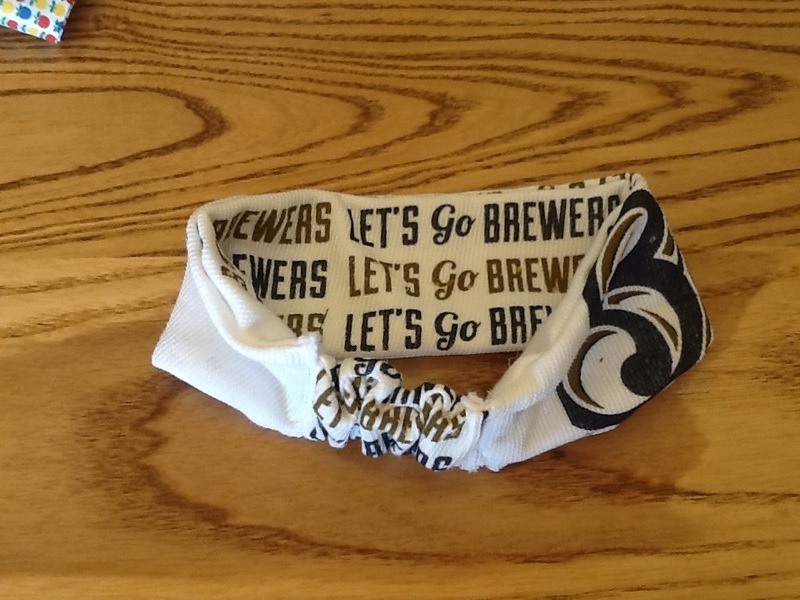 Little girls always seem to love headbands. When I was young I never really liked the plastic headbands so I decided to make a few for my little girl and other little girls in the family for Christmas. 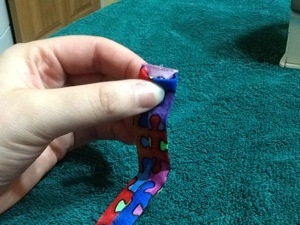 On Pinterest I found this blog: http://www.happytogethercreates.com/2011/07/double-sided-fabric-headband-pattern.html?m=1 that was simple and looked pretty easy. I don’t remember exactly the widths I cut everything, so if I make more later I’ll make a more detailed post. One thing I did do is for the main part I put the two pieces of fabric “inside out” then I folded it in half and cut it to look like a wine bottle. This helped give it the right shape. 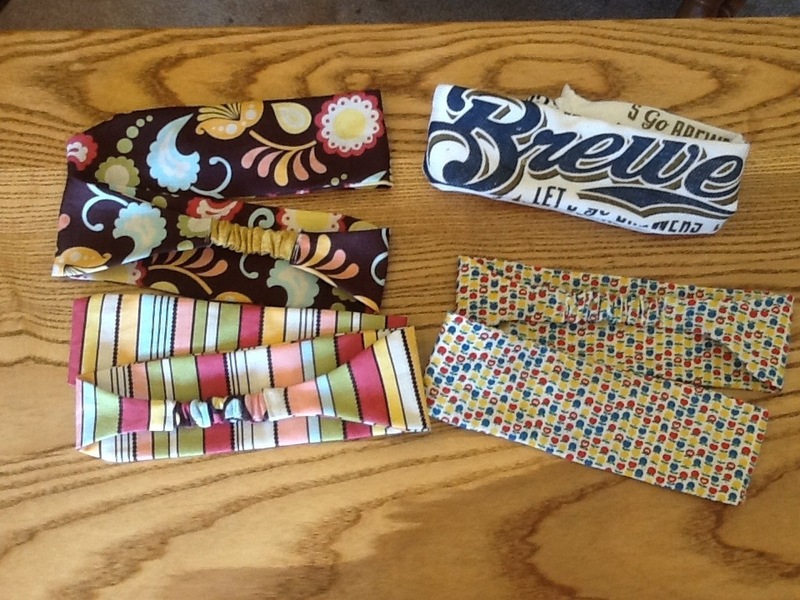 Here are some of the headbands I made for Christmas and other gifts. For Christmas gifts I made a few more bow ties, but before I made them I had a chance to look at an old bow tie my Aunt made for my dad when he was in high school or college. 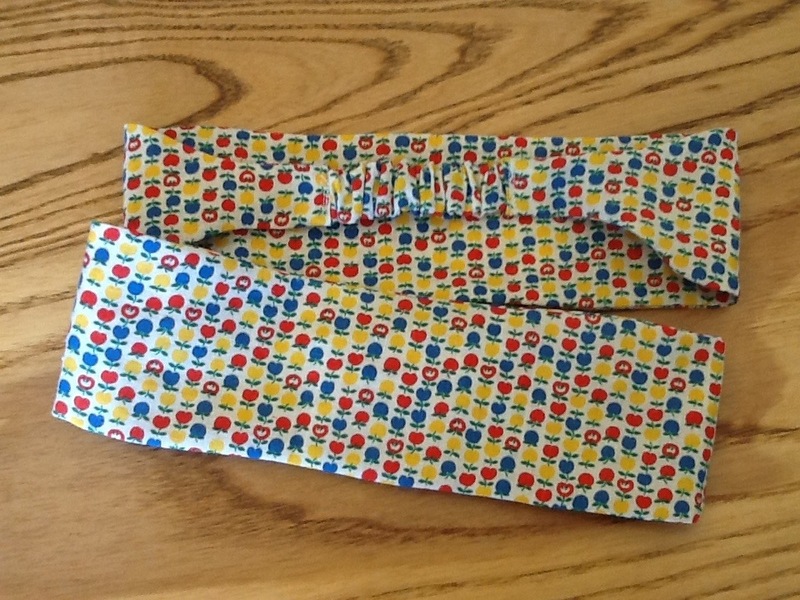 If you haven’t seen my first post on how to make a bow tie, click the link for more details. I tried to hand stitch the center part completely but found that didn’t really make much of a difference and was a lot of work. So once the bow tie is assembled I hand stitch the back ring to the neck strap, then when I get to each corner I use 3-4 stitches on the outside of the bow. 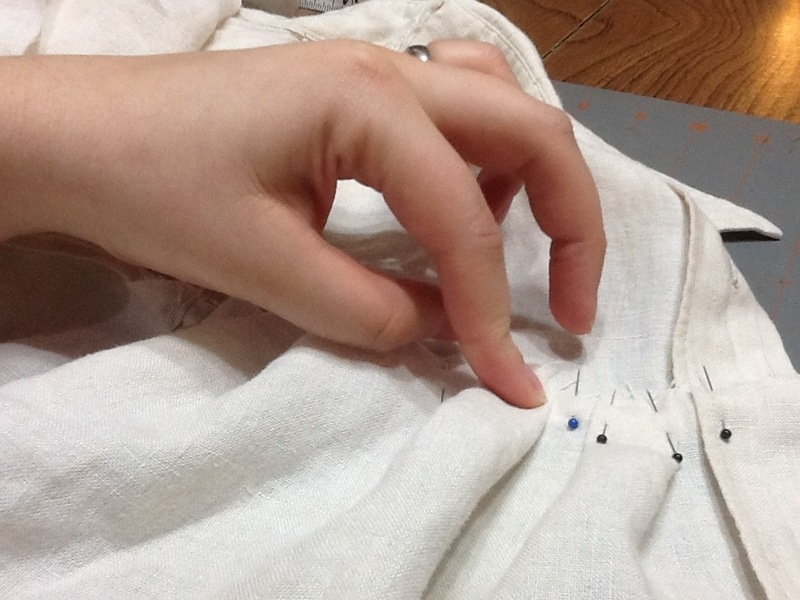 I found that when I hand stitch this way they are less likely to move around. 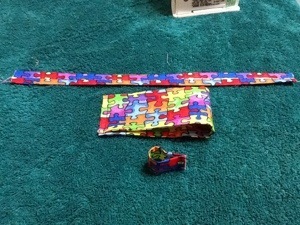 I made 4 total, my son helped pick out the fabric. 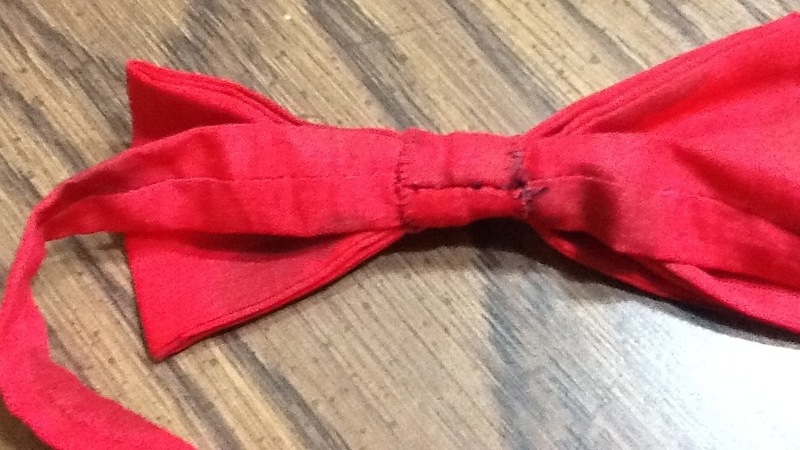 A few days back I was experimenting with the different Bow Tie tutorials out there. I found that there is the basic “simple” one, then there is the actual bow tie that you tie. When I tried them both I decided that I really liked the more complicated one better; however, for kids I’m giving the simple one a trie first. Don’t mind orange, it was my “cheap” test material. 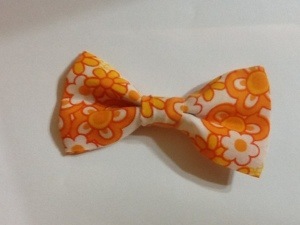 This is my first try at the more complicated bow tie, I actually created the pattern and tied it myself (that will be a later post as I DO plan to make some of these later). 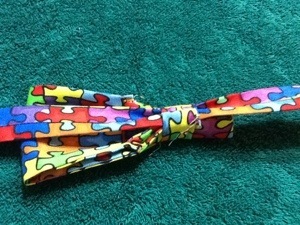 I do admit that I did have to YouTube how to tie a bow tie! Doesn’t it look really nice!! To start with, I measured my son’s neck. It was about 11 1/2 inches, so I made my neck piece 14 inches by 2 inches. I should have made it 15 or 16 inches. I would recommend adding 4 or 5 inches onto the size of your child’s neck. 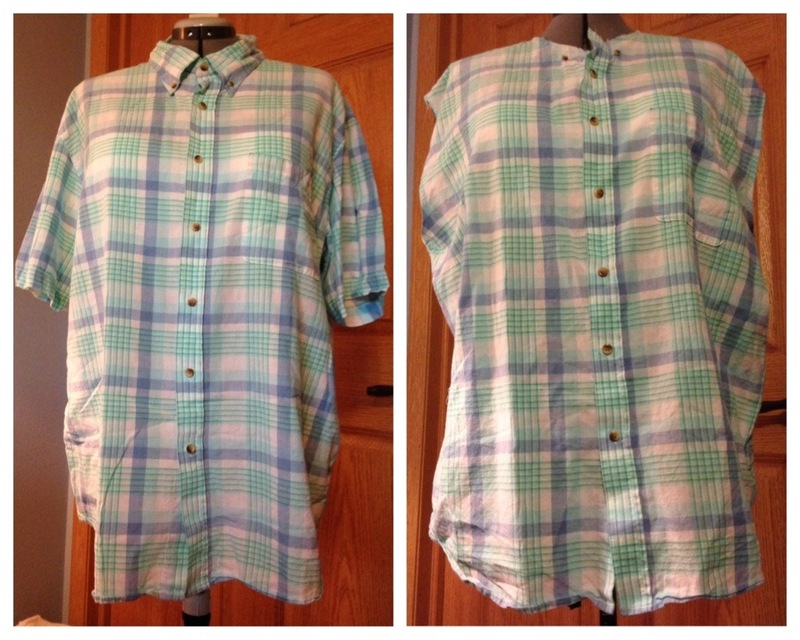 You can also measure the neck of the shirt to get a better estimate, but if you do that you don’t need to add as much if you measure that way. 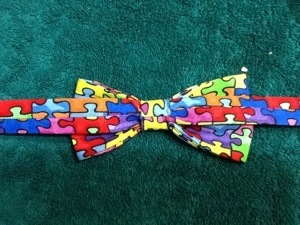 In the blog they used 12 inches by 3 inches for the bow tie part, but they found it was too long. 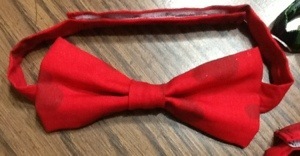 So I decided to make my bow tie part 10 1/2 inches by 3 inches. The small piece I made the same 2 by 3 inches. Now, on the ends of the neck part I like to fold one side in, then the other side, and use a chopstick or un-sharpened pencil to get the two corners. See, nicely tucked in and ready to have the Velcro on it or how ever you plan to finish it. I like Velcro because it’s cheap and you can get a big roll that you can cut to size. 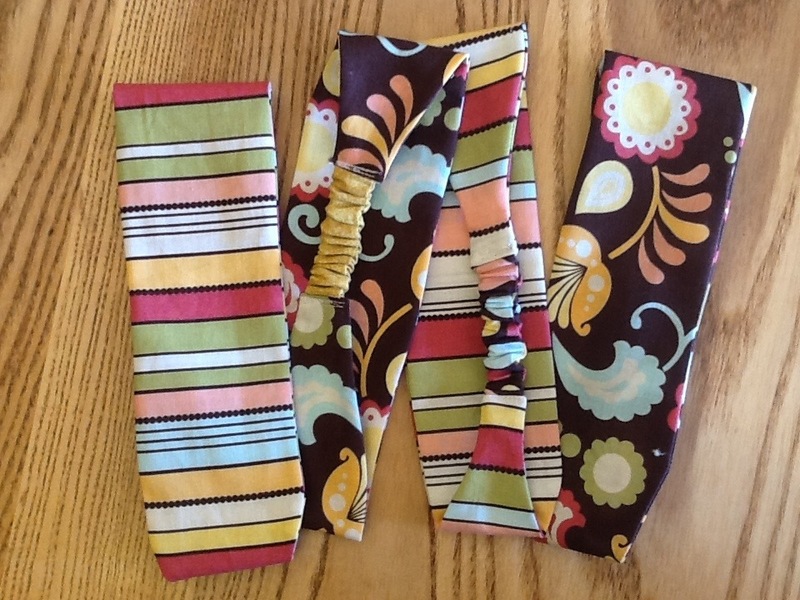 Now, like the blog post shows I folded the bow part like an accordion and put the middle ring around it. I then took the neck piece and pushed it in as I pushed the bow in. 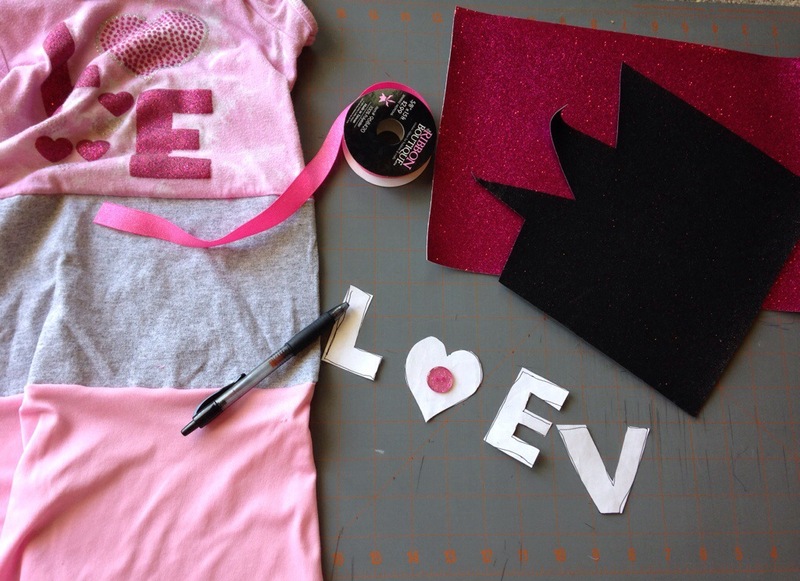 Then I made sure the bow was in the middle of the neck piece so the velcro will be in the back. I also made sure the bow was center and just right. Once It looked good to me I took it one step further than the blog mentioned. 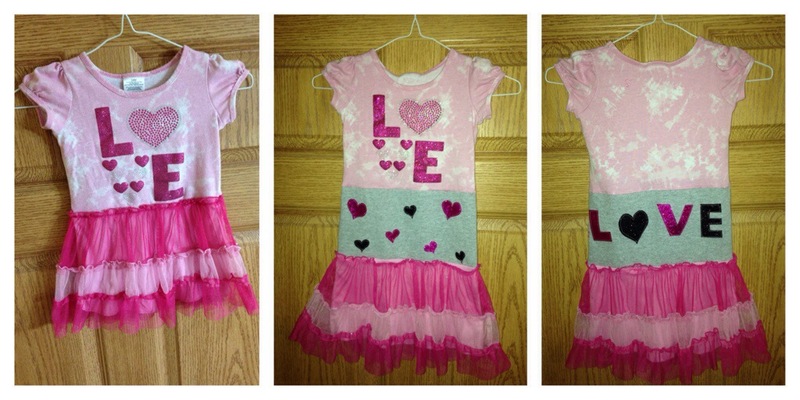 I hand stitched all three parts together. I stitched the bow to the neck piece, then the neck piece to the center ring, then I moved to the other side and did the same thing. When I moved to the other side, I slid the needle through the back of the ring. And here’s what it looks like on my son. 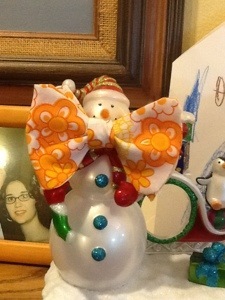 I don’t like to put my kids face up on a public blog, so I zoomed in on the bow tie! A few additional things I would like to note, the tighter the center ring is the more the bow tie will stay put. But if it’s too tight it’s really hard to put on. Also, when hand stitching I should have tried to make the stitches a little tighter. 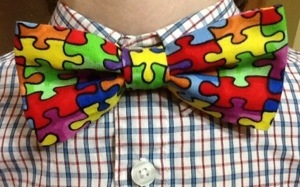 The bow tie doesn’t come apart, but the bow tie becomes off centered. 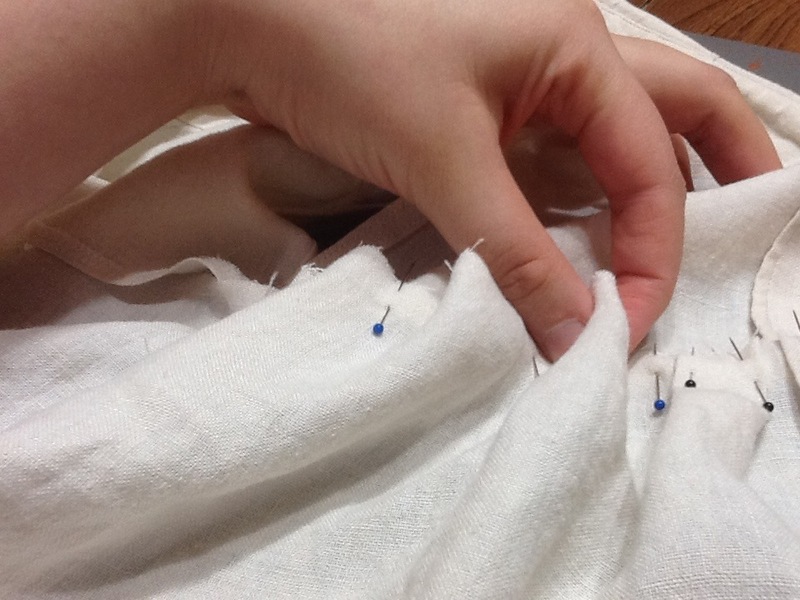 So make sure the center ring is nice and tight, and the hand stitching is nice and tight too! 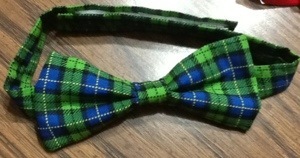 *EDIT* I found more hand stitching was necessary to help keep the bow tie from becoming off centered. 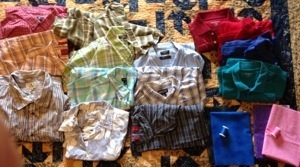 See this post for more details!